This very interesting and historically important machine must forever carry a question mark inasmuch as there is no way to conclusively date it. However the circumstantial evidence is overwhelming and I am convinced it was built sometime in the summer or fall of 1878, making it one of the earliest surviving tinfoil phonographs. A bit of history: this machine was made by a home craftsman who very closely followed instructions published in a Supplement Edition (no. 133) of Scientific American dated July 20, 1878. The article was entitled "How to Build a Working Phonograph" and explained in detail how a skilled craftsman (of whom there were many at the time) could make a working phonograph with only $1.50 worth of common materials (and many hours of labor). "Now that Edison has invented the Phonograph, it is easy enough to make one, and every one wonders that it had not been done before. The Phonograph, truly wonderful as it is, is exceedingly simple and may be made at a slight expense". This article did not sit well with the Edison Speaking Phonograph Company, who had purchased the rights to Edison's patents in April. On July 24, 1878, Edison's close associate, Charles Batchelor, sent a telegram to Edison about it: "Is it right for Scientific [American] to print instructions on how to make a phono. and give dimensions etc[.] without telling them that by making from them they infringe[?]" (Edison was traveling in the west at the time; his reply has not been found.) One of the directors of the Edison Speaking Phonograph Company wrote "Painter and others attach great importance to Scientific Americans [sic] Article and drawings ignoring fact of its being patented. Suggest asking Munn [editor at the magazine] withdraw invitations to public to infringe and say infringers [will] be prosecuted. 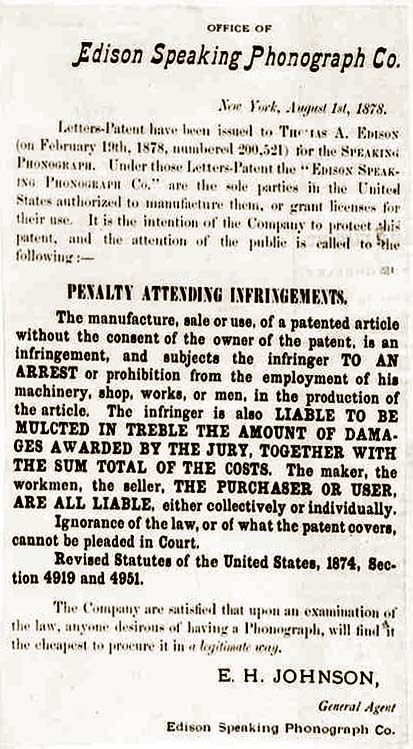 "The magazine refused to back down, however, so Edward Johnson, manager of the Phonograph Company, published a circular dated August 1, 1878 warning people that making, selling, or using an infringing machine would leave them liable to prosecution. 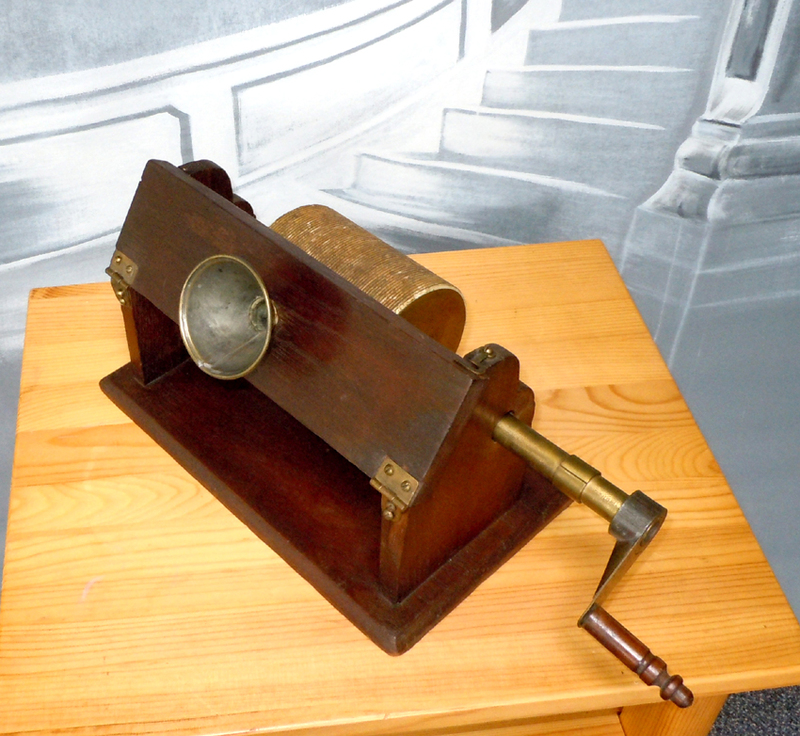 But the magazine was correct: the phonograph was a fundamentally simple device and their very precise instructions made it clear how to build one out of wood and brass, with a mandrel cast from plaster of paris. No one can ever know how many may have been made, but what is clear is that few of the machines that craftsmen did illegally make could have survived the intervening 145 years. Like the French phonograph made by Vital, the mostly wood and plaster construction makes this phonograph infinitely more fragile than cast iron examples. So, how can we know if this (and one other known survivor, described and illustrated in an article in the July 2009 issue of The Sound Box) dates to 1878 or to a later period? The answer is that we cannot be absolutely certain. It is possible that someone could have found a copy of the supplement and constructed it in later years. However for very many reasons that prospect is very unlikely. Magazines, as well as the tinfoil phonograph itself, had short shelf lives. When the instructions were printed during that summer of 1878 there was plenty of motivation for a craftsman to use his skills to build one. 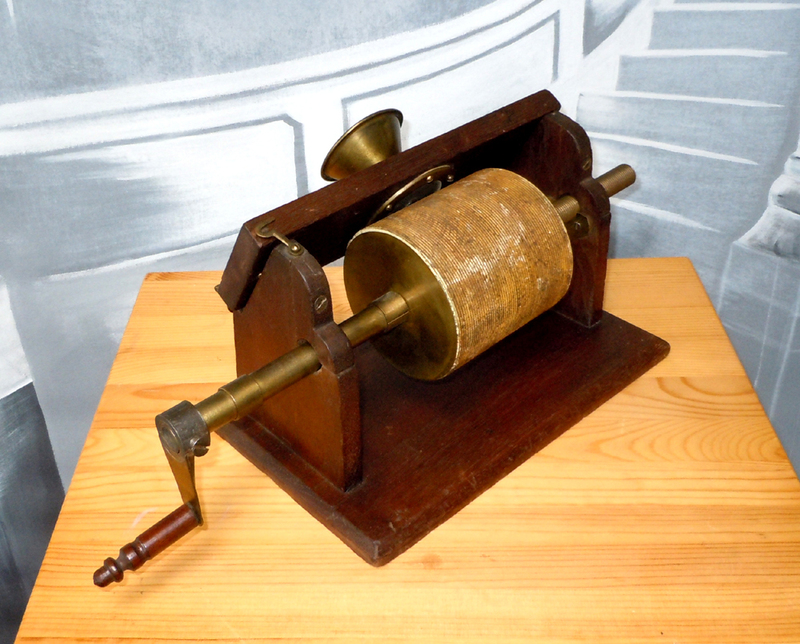 No phonographs were available for private ownership, following the brief experiment in selling 'demonstration' machines made by Hardy or Bergmann in the spring of 1878. The Edison Speaking Phonograph Company controlled all distribution, and in mid-1878 they limited sales of phonographs to authorized agents who used them solely for public exhibitions. Anyone in the general public who wanted a phonograph would have to make it -- they could not be openly purchased. However, the novelty of the tinfoil phonograph was very quick to fade. By 1879 interest in phonograph exhibitions had dwindled to such an extent that the Edison Speaking Phonograph Company went back to the concept of marketing phonographs to the public, offering the Parlor Model for home use. But even at $10, for a precision-made cast-iron and steel machine, sales were abysmal. No one cared anymore. Interest dropped off even further after that, making it exceedingly unlikely that a craftsman would go to the considerable time and effort to construct an obsolete machine of this quality after 1878 or 1879. Despite its simplicity, this is a very well-made machine that clearly took a great many hours of labor to construct. It is not a toy; it is a surprisingly substantial machine with a base measuring 11" by 7" and with a mandrel 4" long and 4" in diameter -- much larger than a 'demonstration' or 'Parlor' model tinfoil. Built primarily of finely finished walnut, all of the fittings were neatly made to not only work well, but to look attractive. The small speaker is nickel-plated brass (though much of the old nickel has since worn). The craftsman improved upon the printed instructions of the magazine in small details to add some elegance to what was otherwise a plain but functional machine, including beveled edges on the base; finely finished wood surfaces; collars on one side of the main brass shaft to limit the range of the mandrel's movement from side to side, preventing butting into the pillars; a complex crank handle; and a brass retaining ring for the diaphragm instead of wood blocks. Even the nickeled brass mouthpiece was an improvement over the porcelain speaker in the instructions, or the wood mouthpiece in the only other known surviving machine. Clearly, a lot of time and careful thought went into its construction. Whether large or small, wood or metal, all tinfoil phonographs must be made with a very high degree of precision so that there is absolutely no waver. The mandrel must run perfectly true in order for the indentations of the sound waves to record evenly. This machine was crafted with great care to work perfectly despite the humble materials from which it was made. It was not just a simple showpiece, it was a serious scientific instrument. All that is known of this specific machine's history is that it was acquired in the 1960s by a old-time phonograph collector and author, and that it was clearly very old when he found it. He treasured it for 50 years, selling it only months before he passed away. For all of the reasons mentioned, the likelihood of an obsolete phonograph of this quality and precision being made between the 1880s and the 1960s is virtually nil. There is very compelling evidence to believe it dates to the dawn of phonographic history; it is a superbly crafted machine with clearly authentic patina and wear. Even if its manufacture date will always remain an open question, it is definitely an important relic of the early history of the phonograph, an exquisitely built example of a tinfoil machine which created a rift between Edison and his close friends at Scientific American, who were among his most important media promoters. 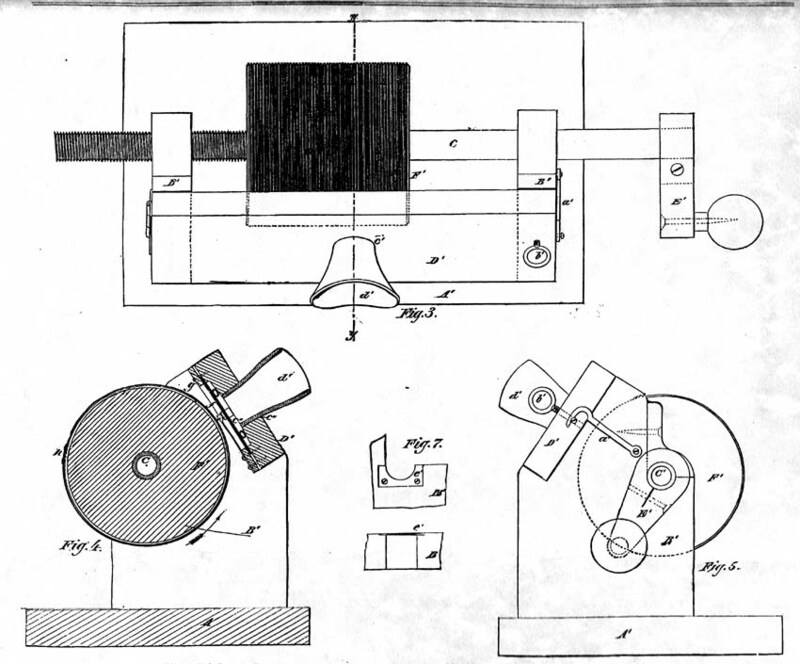 Drawings published in the July 20, 1878 Supplement of the Scientific American to accompany detailed written instructions on how to build this phonograph.